We started getting our Christmas decorations out in November this year. We have so many activities and outings planned every weekend in December that I did not have a choice. The good part is that I am now ready for the holiday season! With decorations comes baking Christmas cookies, meat pies, meatballs stew, and Stewed Pig’s Feet. Can you ever tell that we are a French Canadian family! We also like to drink eggnog, so why not bake my favourite chocolate cupcakes with eggnog for a deliciously sweet Chocolate Eggnog Cupcakes for dessert at Christmas! I absolutely love these chocolaty cupcakes and so did my family. I can’t wait to make them again! What is your favourite dessert for the holidays? Melt the chocolate in a double boiler, set aside until its cool to touch. Sift the flour, salt and cocoa in another and then add to the wet ingredients. Mix in the eggnog until combined. Fill liners half way and bake 21 minutes. Pipe onto cooled cupcakes and sprinkle cinnamon on top. I hope you enjoyed my Chocolate Eggnog Cupcakes Recipe! If you make it, make sure to share with us on Facebook or Twitter! Also, check out all of our other Recipes. These look amazing!! I just love eggnog and add chocolate sounds like a great combo!! I love the idea of combining chocolate and eggnog, I’ll have to try these! 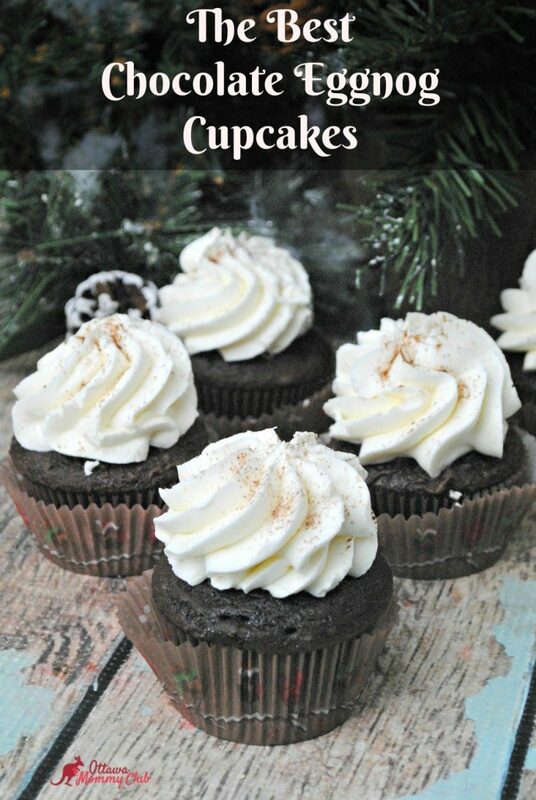 These look and sound awesome, I love eggnog so I would love these cupcakes, these make a great Christmas treat!! They look amazing…..very tempting I just may have to make these. I am a huge fan of eggnog. I am definitely going to be making these cupcakes. These sound a bit complicated for me – but definitely worth a try – I mean just LOOK at them!? They look so luxurious! What a special holiday treat! I don’t care much for eggnog either but I’m with Debbie,those cupcakes sure look delicious!